Whether you’re interested in learning how to apply facial recognition to video streams, building a complete deep learning pipeline for image classification, or simply want to tinker with your Raspberry Pi and add image recognition to a hobby project, you’ll need to learn OpenCV somewhere along the way. The truth is that learning OpenCV used to be quite challenging. The documentation was hard to navigate. The tutorials were hard to follow and incomplete. And even some of the books were a bit tedious to work through. The good news is learning OpenCV isn’t as hard as it used to be. And in fact, I’ll go as far as to say studying OpenCV has become significantly easier. And to prove it to you (and help you learn OpenCV), I’ve put together this complete guide to learning the fundamentals of the OpenCV library using the Python programming language. Let’s go ahead and get started learning the basics of OpenCV and image processing. By the end of today’s blog post, you’ll understand the fundamentals of OpenCV. This OpenCV tutorial is for beginners just getting started learning the basics. 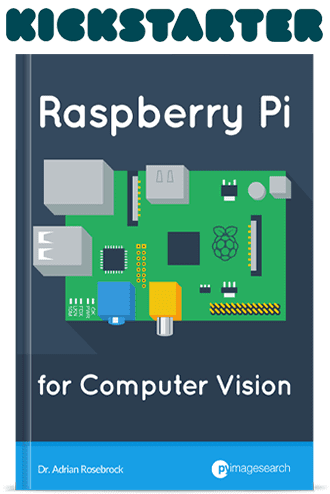 Inside this guide, you’ll learn basic image processing operations using the OpenCV library using Python. 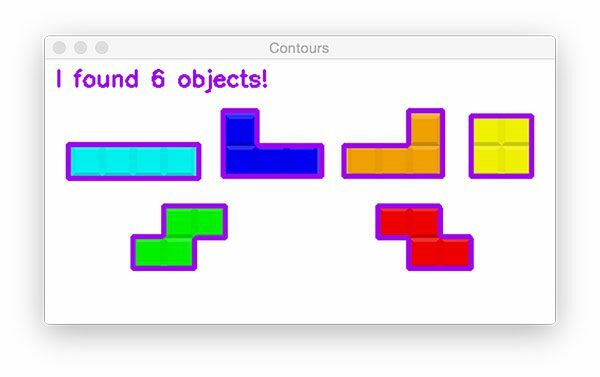 And by the end of the tutorial you’ll be putting together a complete project to count basic objects in images using contours. While this tutorial is aimed at beginners just getting started with image processing and the OpenCV library, I encourage you to give it a read even if you have a bit of experience. A quick refresher in OpenCV basics will help you with your own projects as well. The first step today is to install OpenCV on your system (if you haven’t already). I maintain an OpenCV Install Tutorials page which contains links to previous OpenCV installation guides for Ubuntu, macOS, and Raspberry Pi. You should visit that page and find + follow the appropriate guide for your system. Note: If you are using Python virtual environments don’t forget to use the workon command to enter your environment before installing imutils ! Before going too far down the rabbit hole, be sure to grab the code + images from the “Downloads” section of today’s blog post. 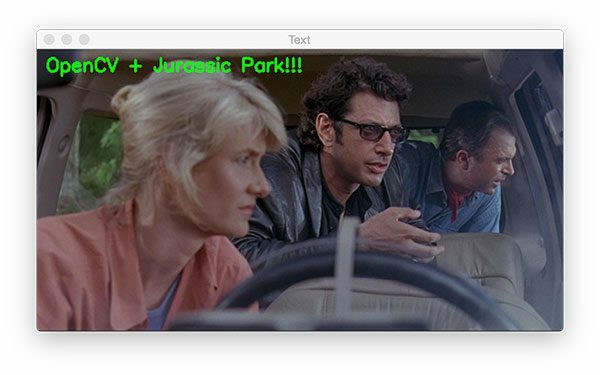 Our first script, opencv_tutorial_01.py will cover basic image processing operations using an image from the movie, Jurassic Park ( jp.png ). 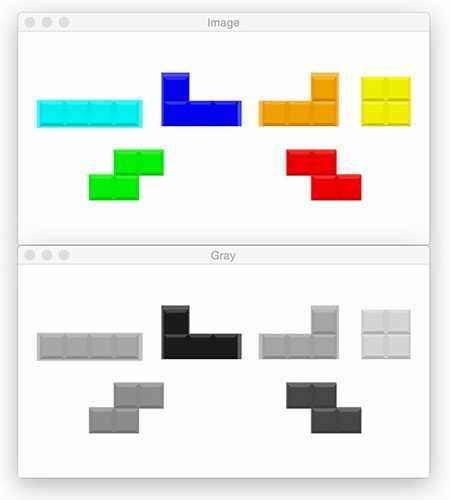 From there, opencv_tutorial_02.py will show you how to use these image processing building blocks to create an OpenCV application to count the number of objects in a Tetris image ( tetris_blocks.png ). Figure 1: Learning OpenCV basics with Python begins with loading and displaying an image — a simple process that requires only a few lines of code. On Lines 2 and 3 we import both imutils and cv2 . The cv2 package is OpenCV and despite the 2 embedded, it can actually be OpenCV 3 (or possibly OpenCV 4 which may be released later in 2018). The imutils package is my series of convenience functions. Now that we have the required software at our fingertips via imports, let’s load an image from disk into memory. 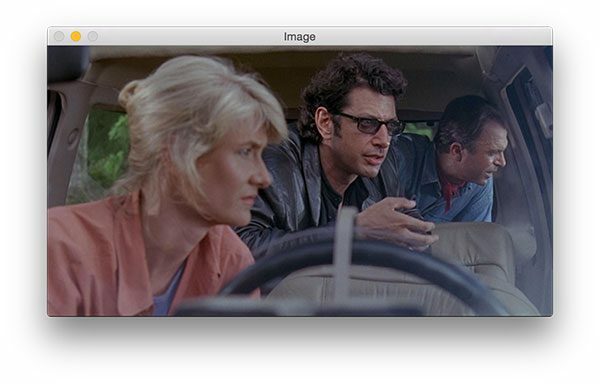 To load our Jurassic Park image (from one of my favorite movies), we call cv2.imread("jp.png") . As you can see on Line 8, we assign the result to image . Our image is actually just a NumPy array. Later in this script, we’ll need the height and width. So on Line 9, I call image.shape to extract the height, width, and depth. Therefore, the dimensions of an image represented as a NumPy array are actually represented as (height, width, depth). Depth is the number of channels — in our case this is three since we’re working with 3 color channels: Blue, Green, and Red. To display the image on the screen using OpenCV we employ cv2.imshow("Image", image) on Line 14. The subsequent line waits for a keypress (Line 15). This is important otherwise our image would display and disappear faster than we’d even see the image. Note: You need to actually click the active window opened by OpenCV and press a key on your keyboard to advance the script. OpenCV cannot monitor your terminal for input so if you a press a key in the terminal OpenCV will not notice. Again, you will need to click the active OpenCV window on your screen and press a key on your keyboard. Figure 2: Top: grayscale gradient where brighter pixels are closer to 255 and darker pixels are closer to 0. Bottom: RGB venn diagram where brighter pixels are closer to the center. All images consist of pixels which are the raw building blocks of images. Images are made of pixels in a grid. A 640 x 480 image has 640 columns (the width) and 480 rows (the height). There are 640 * 480 = 307200 pixels in an image with those dimensions. Each pixel in a grayscale image has a value representing the shade of gray. In OpenCV, there are 256 shades of gray — from 0 to 255. So a grayscale image would have a grayscale value associated with each pixel. Pixels in a color image have additional information. There are several color spaces that you’ll soon become familiar with as you learn about image processing. 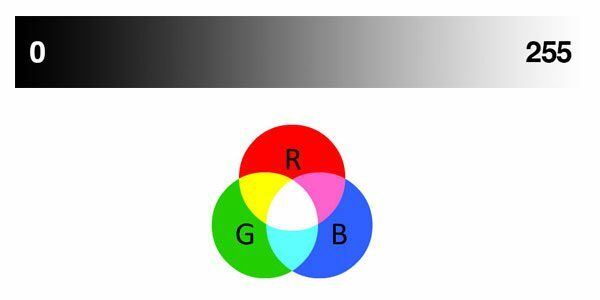 For simplicity let’s only consider the RGB color space. In OpenCV color images in the RGB (Red, Green, Blue) color space have a 3-tuple associated with each pixel: (B, G, R) . Notice the ordering is BGR rather than RGB. This is because when OpenCV was first being developed many years ago the standard was BGR ordering. Over the years, the standard has now become RGB but OpenCV still maintains this “legacy” BGR ordering to ensure no existing code breaks. Each value in the BGR 3-tuple has a range of [0, 255] . How many color possibilities are there for each pixel in an RGB image in OpenCV? That’s easy: 256 * 256 * 256 = 16777216 . As shown previously, our image dimensions are width=600, height=322, depth=3 . We can access individual pixel values in the array by specifying the coordinates so long as they are within the max width and height. The code, image[100, 50] , yields a 3-tuple of BGR values from the pixel located at x=50 and y=100 (again, keep in mind that the height is the number of rows and the width is the number of columns — take a second now to convince yourself this is true). As stated above, OpenCV stores images in BGR ordering (unlike Matplotlib, for example). Check out how simple it is to extract the color channel values for the pixel on Line 19. Extracting “regions of interest” (ROIs) is an important skill for image processing. Say, for example, you’re working on recognizing faces in a movie. First, you’d run a face detection algorithm to find the coordinates of faces in all the frames you’re working with. Then you’d want to extract the face ROIs and either save them or process them. 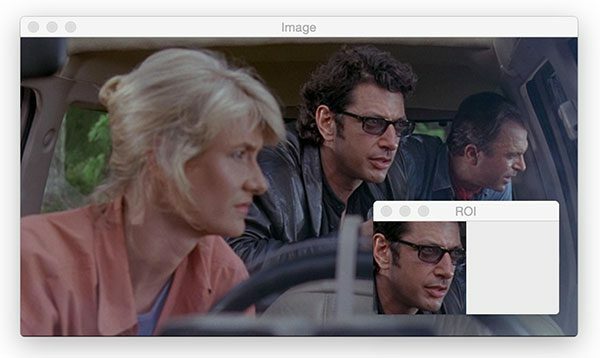 Locating all frames containing Dr. Ian Malcolm in Jurassic Park would be a great face recognition mini-project to work on. For now, let’s just manually extract an ROI. This can be accomplished with array slicing. Figure 3: Array slicing with OpenCV allows us to extract a region of interest (ROI) easily. 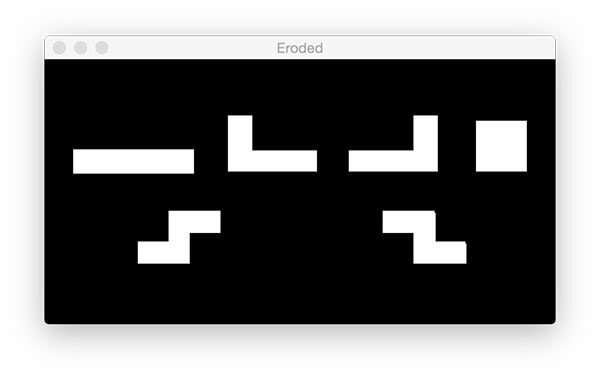 Array slicing is shown on Line 24 with the format: image[startY:endY, startX:endX] . This code grabs an roi which we then display on Line 25. Just like last time, we display until a key is pressed (Line 26). As you can see in Figure 3, we’ve extracted the face of Dr. Ian Malcolm. 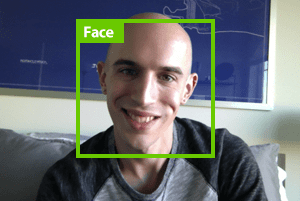 I actually predetermined the (x, y)-coordinates using Photoshop for this example, but if you stick with me on the blog you could detect and extract face ROI’s automatically. Resizing images is important for a number of reasons. First, you might want to resize a large image to fit on your screen. Image processing is also faster on smaller images because there are fewer pixels to process. In the case of deep learning, we often resize images, ignoring aspect ratio, so that the volume fits into a network which requires that an image be square and of a certain dimension. On Line 29, we have resized an image ignoring aspect ratio. Figure 4 (right) shows that the image is resized but is now distorted because we didn’t take into account the aspect ratio. Figure 4: Resizing an image with OpenCV and Python can be conducted with cv2.resize however aspect ratio is not preserved automatically. Recall back to Line 9 of this script where we extracted the width and height of the image. Let’s say that we want to take our 600-pixel wide image and resize it to 300 pixels wide while maintaining aspect ratio. On Line 35 we calculate the ratio of the new width to the old width (which happens to be 0.5). From there, we specify our dimensions of the new image, dim . We know that we want a 300-pixel wide image, but we must calculate the height using the ratio by multiplying h by r (the original height and our ratio respectively). 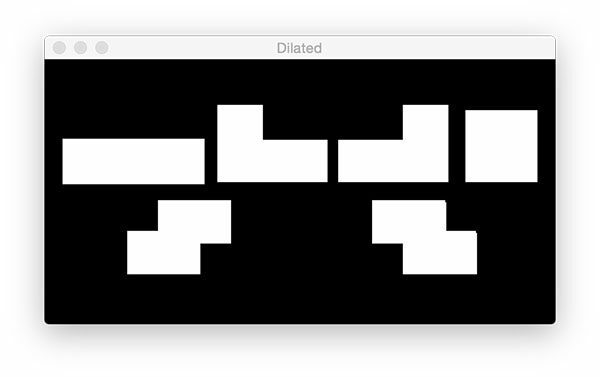 Feeding dim (our dimensions) into the cv2.resize function, we’ve now obtained a new image named resized which is not distorted (Line 37). Figure 5: Resizing images while maintaining aspect ratio with OpenCV is a three-step process: (1) extract the image dimensions, (2) compute the aspect ratio, and (3) resize the image (cv2.resize) along one dimension and multiply the other dimension by the aspect ratio. See Figure 6 for an even easier method. 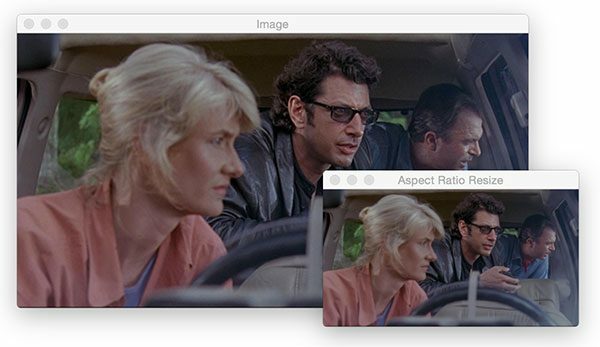 But can we make this process of preserving aspect ratio during resizing even easier? Computing the aspect ratio each time we want to resize an image is a bit tedious, so I wrapped the code in a function within imutils . 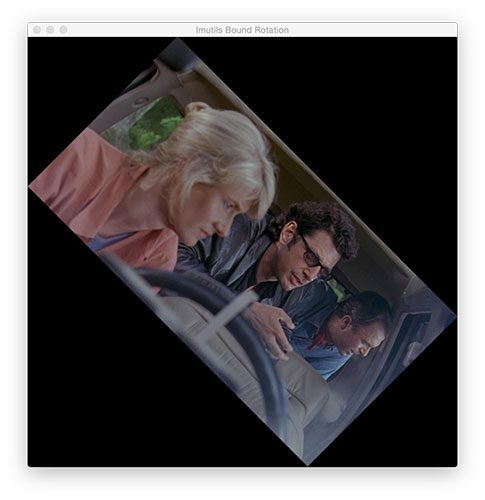 In a single line of code, we’ve preserved aspect ratio and resized the image. All you need to provide is your target width or target height as a keyword argument (Line 43). Figure 6: If you’d like to maintain aspect ratio while resizing images with OpenCV and Python, simply use imutils.resize. Now your image won’t risk being “squished” as in Figure 4. Rotating an image about the center point requires that we first calculate the center (x, y)-coordinates of the image (Line 50). Note: We use // to perform integer math (i.e., no floating point values). From there we calculate a rotation matrix, M (Line 51). The -45 means that we’ll rotate the image 45 degrees clockwise. Recall from your middle/high school geometry class about the unit circle and you’ll be able to remind yourself that positive angles are counterclockwise and negative angles are clockwise. From there we warp the image using the matrix (effectively rotating it) on Line 52. Figure 8: With imutils.rotate, we can rotate an image with OpenCV and Python conveniently with a single line of code. Why in the world is the image clipped? There’s a lot going on behind the scenes of rotate_bound . If you’re interested in how the method on Line 64 works, be sure to check out this blog post. Figure 9: The rotate_bound function of imutils will prevent OpenCV from clipping the image during a rotation. See this blog post to learn how it works! Perfect! The entire image is in the frame and it is correctly rotated 45 degrees clockwise. In many image processing pipelines, we must blur an image to reduce high-frequency noise, making it easier for our algorithms to detect and understand the actual contents of the image rather than just noise that will “confuse” our algorithms. Blurring an image is very easy in OpenCV and there are a number of ways to accomplish it. Figure 10: This image has undergone a Gaussian blur with an 11 x 11 kernel using OpenCV. Blurring is an important step of many image processing pipelines to reduce high-frequency noise. On Line 70 we perform a Gaussian Blur with an 11 x 11 kernel the result of which is shown in Figure 10. Larger kernels would yield a more blurry image. 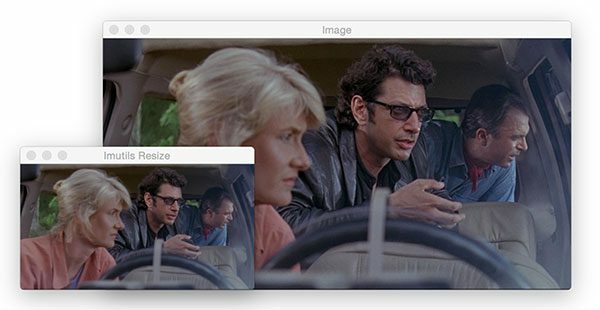 Smaller kernels will create less blurry images. To read more about kernels, refer to this blog post or the PyImageSearch Gurus course. In this section, we’re going to draw a rectangle, circle, and line on an input image. We’ll also overlay text on an image as well. Before we move on with drawing on an image with OpenCV, take note that drawing operations on images are performed in-place. Therefore at the beginning of each code block, we make a copy of the original image storing the copy as output . We then proceed to draw on the image called output in-place so we do not destroy our original image. First, we make a copy of the image on Line 75 for reasons just explained. Then we proceed to draw the rectangle. img : The destination image to draw upon. We’re drawing on output . pt1 : Our starting pixel coordinate which is the top-left. In our case, the top-left is (320, 60) . pt2 : The ending pixel — bottom-right. The bottom-right pixel is located at (420, 160) . color : BGR tuple. To represent red, I’ve supplied (0 , 0, 255) . thickness : Line thickness (a negative value will make a solid rectangle). I’ve supplied a thickness of 2 . Since we are using OpenCV’s functions rather than NumPy operations we can supply our coordinates in (x, y) order rather than (y, x) since we are not manipulating or accessing the NumPy array directly — OpenCV is taking care of that for us. Figure 11: Drawing shapes with OpenCV and Python is an easy skill to pick up. In this image, I’ve drawn a red box using cv2.rectangle. I pre-determined the coordinates around the face for this example, but you could use a face detection method to automatically find the face coordinates. img : The output image. center : Our circle’s center coordinate. I supplied (300, 150) which is right in front of Ellie’s eyes. radius : The circle radius in pixels. I provided a value of 20 pixels. color : Circle color. This time I went with blue as is denoted by 255 in the B and 0s in the G + R components of the BGR tuple, (255, 0, 0) . thickness : The line thickness. 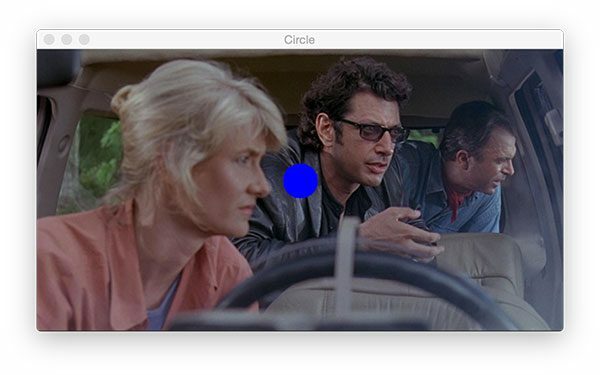 Since I supplied a negative value ( -1 ), the circle is solid/filled in. Figure 12: OpenCV’s cv2.circle method allows you to draw circles anywhere on an image. I’ve drawn a solid circle for this example as is denoted by the -1 line thickness parameter (positive values will make a circular outline with variable line thickness). It looks like Ellie is more interested in the dinosaurs than my big blue dot, so let’s move on! Next, we’ll draw a red line. This line goes through Ellie’s head, past her eye, and to Ian’s hand. Just as in a rectangle, we supply two points, a color, and a line thickness. 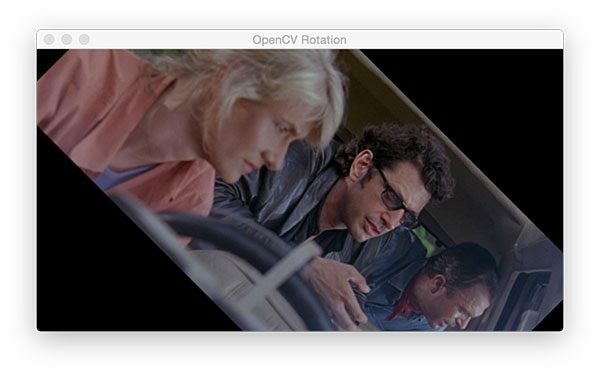 OpenCV’s backend does the rest. Figure 13: Similar to drawing rectangles and circles, drawing a line in OpenCV using cv2.line only requires a starting point, ending point, color, and thickness. Oftentimes you’ll find that you want to overlay text on an image for display purposes. If you’re working on face recognition you’ll likely want to draw the person’s name above their face. 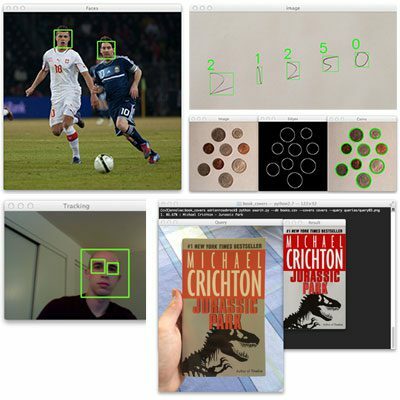 Or if you advance in your computer vision career you may build an image classifier or object detector. In these cases, you’ll find that you want to draw text containing the class name and probability. text : The string of text we’d like to write/draw on the image. pt : The starting point for the text. font : I often use the cv2.FONT_HERSHEY_SIMPLEX . The available fonts are listed here. scale : Font size multiplier. thickness : The thickness of the stroke in pixels. Figure 14: Oftentimes, you’ll find that you want to display text on an image for visualization purposes. Using the cv2.putText code shown above you can practice overlaying text on an image with different colors, fonts, sizes, and/or locations. You have downloaded the code from the “Downloads” section of this blog post. You have unzipped the files. You have installed OpenCV and the imutils library on your system. To execute our first script, open a terminal or command window and navigate to the files or extract them if necessary. The command is everything after the bash prompt $ character. Just type python opencv_tutorial_01.py in your terminal and then the first image will appear. To cycle through each step that we just learned, make sure an image window is active, and press any key. Our first couple code blocks above told Python to print information in the terminal. If your terminal is visible, you’ll see the terminal output (Lines 2 and 3) shown. Figure 15: Output animation displaying the OpenCV fundamentals we learned from this first example Python script. Now we’re going to shift gears and work on the second script included in the “Downloads” associated with this blog post. Figure 16: If you’ve ever played Tetris (who hasn’t? ), you’ll recognize these familiar shapes. In the 2nd half of this OpenCV fundamentals tutorial, we’re going to find and count the shape contours. On Lines 2-4 we import our packages. This is necessary at the start of each Python script. For this second script, I’ve imported argparse — a command line arguments parsing package which comes with all installations of Python. Take a quick glance at Lines 7-10. These lines allow us to provide additional information to our program at runtime from within the terminal. Command line arguments are used heavily on the PyImageSearch blog and in all other computer science fields as well. I encourage you to read about them on this post: Python, argparse, and command line arguments. We have one required command line argument --image , as is defined on Lines 8 and 9. We’ll learn how to run the script with the required command line argument down below. For now, just know that wherever you encounter args["image"] in the script, we’re referring to the path to the input image. We load the image into memory on Line 14. The parameter to the cv2.imread function is our path contained in the args dictionary referenced with the "image" key, args["image"] . From there, we display the image until we encounter our first keypress (Lines 15 and 16). We’re going to be thresholding and detecting edges in the image shortly. Therefore we convert the image to grayscale on Line 19 by calling cv2.cvtColor and providing the image and cv2.COLOR_BGR2GRAY flag. Again we display the image and wait for a keypress (Lines 20 and 21). The result of our conversion to grayscale is shown in Figure 17 (bottom). Figure 17: (top) Our Tetris image. (bottom) We’ve converted the image to grayscale — a step that comes before thresholding. 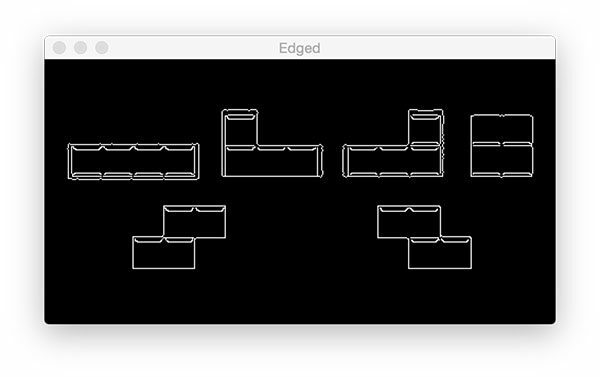 Edge detection is useful for finding boundaries of objects in an image — it is effective for segmentation purposes. Using the popular Canny algorithm (developed by John F. Canny in 1986), we can find the edges in the image. img : The gray image. minVal : A minimum threshold, in our case 30 .
maxVal : The maximum threshold which is 150 in our example. aperture_size : The Sobel kernel size. By default this value is 3 and hence is not shown on Line 25. Different values for the minimum and maximum thresholds will return different edge maps. Figure 18: To conduct edge detection with OpenCV, we make use of the Canny algorithm. Image thresholding is an important intermediary step for image processing pipelines. Thresholding can help us to remove lighter or darker regions and contours of images. Setting pixel vales less than 225 to 255 (white) which corresponds to the foreground of the image (i.e., the Tetris blocks themselves). For more information on the cv2.threshold function, including how the thresholding flags work, be sure to refer to official OpenCV documentation. Segmenting foreground from background with a binary image is critical to finding contours (our next step). Figure 19: Prior to finding contours, we threshold the grayscale image. We performed a binary inverse threshold so that the foreground shapes become white while the background becomes black. Notice in Figure 19 that the foreground objects are white and the background is black. Figure 20: We’re working towards finding contour shapes with OpenCV and Python in this OpenCV Basics tutorial. On Lines 38 and 39, we use cv2.findContours to detect the contours in the image. Take note of the parameter flags but for now let’s keep things simple — our algorithm is finding all foreground (white) pixels in the thresh.copy() image. Line 40 is very important accounting for the fact that cv2.findContours implementation changed between OpenCV 2.4, OpenCV 3, and OpenCV 4. This compatibility line is present on the blog wherever contours are involved. We make a copy of the original image on Line 41 so that we can draw contours on subsequent Lines 44-49. On Line 47 we draw each c from the cnts list on the image using the appropriately named cv2.drawContours . I chose purple which is represented by the tuple (240, 0, 159) . Line 52 builds a text string containing the number of shape contours. Counting the total number of objects in this image is as simple as checking the length of the contours list — len(cnts) . Figure 21: Counting contours with OpenCV is as easy as finding them and then calling len(cnts). Erosions and dilations are typically used to reduce noise in binary images (a side effect of thresholding). On Line 59 we copy the thresh image while naming it mask . Then, utilizing cv2.erode , we proceed to reduce the contour sizes with 5 iterations (Line 60). Figure 22: Using OpenCV we can erode contours, effectively making them smaller or causing them to disappear completely with sufficient iterations. This is typically useful for removing small blobs in mask image. Figure 23: In an image processing pipeline if you ever have the need to connect nearby contours, you can apply dilation to the image. Shown in the figure is the result of dilating contours with five iterations, but not to the point of two contours becoming one. Masks allow us to “mask out” regions of an image we are uninterested in. We call them “masks” because they will hide regions of images we do not care about. Figure 24: When using the thresholded image as the mask in comparison to our original image, the colored regions reappear as the rest of the image is “masked out”. This is, of course, a simple example, but as you can imagine, masks are very powerful. In Figure 24, the background is black now and our foreground consists of colored pixels — any pixels masked by our mask image. 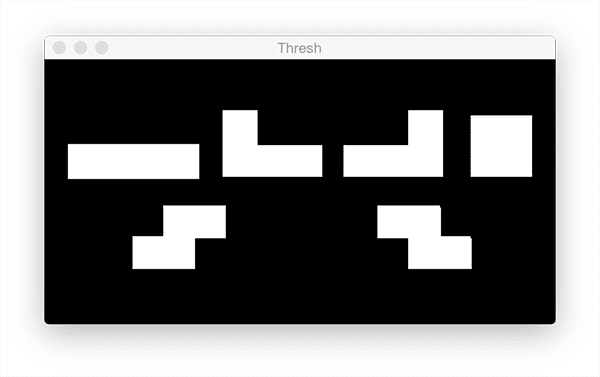 The mask is generated by copying the binary thresh image (Line 73). From there we bitwise AND the pixels from both images together using cv2.bitwise_and . 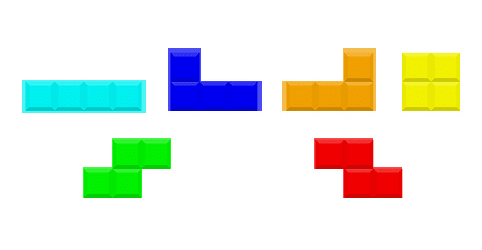 The result is Figure 24 above where now we’re only showing/highlighting the Tetris blocks. 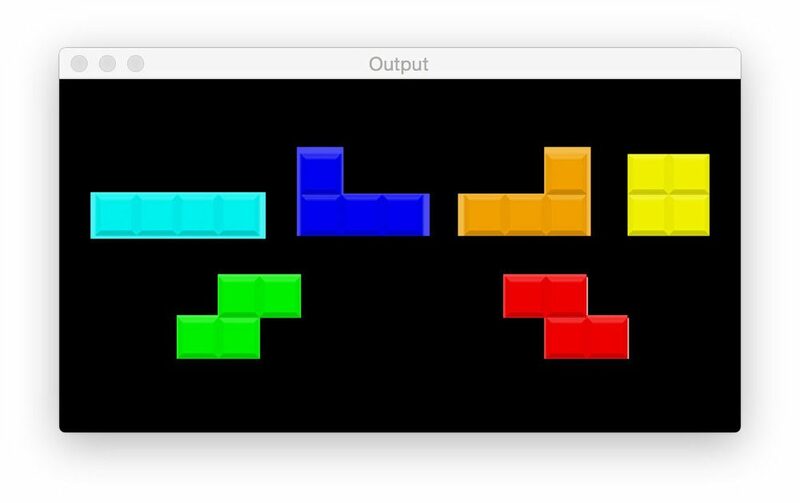 The argument flag is --image and the image argument itself is tetris_blocks.png — a path to the relevant file in the directory. There is no terminal output for this script. Again, to cycle through the images, be sure you click on an image window to make it active, from there you can press a key and it will be captured to move forward to the next waitKey(0) in the script. When the program is finished running, your script will exit gracefully and you’ll be presented with a new bash prompt line in your terminal. Figure 25: Learning OpenCV and the basics of computer vision by counting objects via contours. If you’re looking to continue learning OpenCV and computer vision, be sure to take a look at my book, Practical Python and OpenCV. Inside the book we’ll explore the OpenCV fundamentals we discussed here today in more detail. 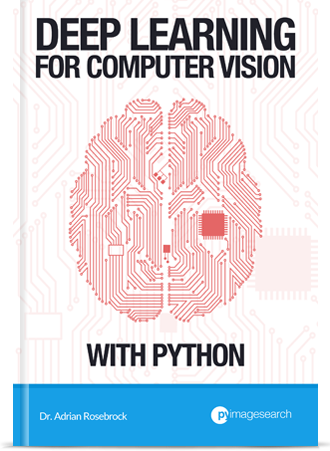 To learn more about Practical Python and OpenCV, and how it can help you learn OpenCV (in less than a single weekend), just click here. In today’s blog post you learned the fundamentals of image processing and OpenCV using the Python programming language. You are now prepared to start using these image processing operations as “building blocks” you can chain together to build an actual computer vision application — a great example of such a project is the basic object counter we created by counting contours. 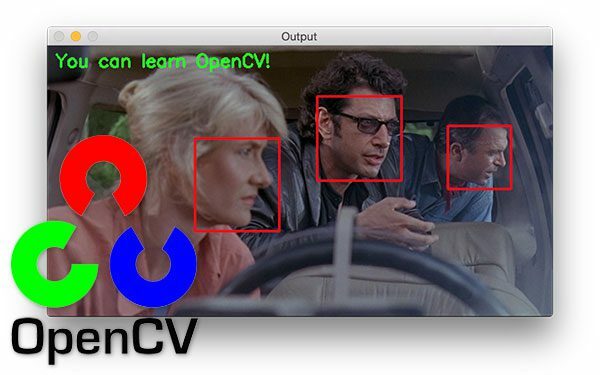 I hope this tutorial helped you learn OpenCV! To be notified when future OpenCV blog posts are published here on PyImageSearch, just enter your email address in the form below! Why don’t you switch to conda environment, that is much easy to deal with than this virtualenv and virtualenvwrapper. Yes and no. Conda has positives but it can also be restrictive. Conda has the benefit of having OpenCV ready to go, but there’s no guarantee it’s been optimized for your particular build either. I also have zero intention on forcing people to use one environment over another — use whatever you are comfortable with, but I do recommend Python virtual environments in some form, regardless if you’re using Conda or virtualenv/virtualenvwrapper. How to install latest pakages of opencv python like 3.4.2 which isn’t available yet with pip command. You’ll want to follow one of my tutorials and compile from source. I would recommend using “opencv-contrib-python” instead. Anyone trying to install OpenCV via pip should read this post first. Directly underneath the “Downloads” header there is a form with a button that says “Download the Code!”. I think you may have missed that form. This is an excellent course of OpenCV, just what I needed! Thanks! Here the angle should be -45 instead of +45 if I am correct. The rotate_bound function actually takes the negative of the angle so the code is correct. When i ran tutorial_02.py i got the below error. Pl help. It sounds like you are trying to execute the script within IPython. Instead, execute it via command line argument and supply the command line arguments. A 640 x 480 image has 640 rows and 480 columns. Should it be 480 rows and 640 columns??? Yes, thank you for catching this typo! I have updated the blog post 🙂 Thanks again! What is the differece between using the same image twice and suing two diff images? We need two inputs to perform bitwise ANDs and ORs. Since our goal is applying the mask to the image we supply the input image twice as both inputs so the output will always be TRUE expect for where the mask is applied. I can’t execute your code to the your images. I coppied all the code you write but the images stay the same before processed. Is there any problems like outdated OpenCV lib version or something else? I don’t suggest copying and pasting. Make sure you use the “Downloads” section of the blog post to download the code and example images. From there you can run the script. My guess is that you accidentally introduced an error in the code or logic during the copy and paste. How the array stores more than one element? Like cnts, cnts, cnts….. Thanks for posting this helpful article, code and details of how-to. The bundle gave it all together – at a good level of clarity. Thank you so much for picking up a copy, Agribot! I’m so happy to hear you found the book helpful. Enjoy it! 1. what changes are meant to be made if the background is any color other than white? 2. How to get rid of the coinciding shadows of different objects. As 2 objects with intersecting shadows are counted as 1? 1. Which image are you referring to? 2. Use the Watershed algorithm. I meant to ask, that the images which are taken as an example while counting the no. of objects, has a white background. So, what if an image has a background color other than white. What changes should be made in that case? 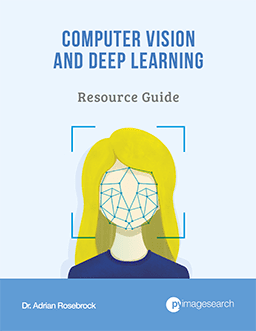 For more information on the basics of computer vision and image processing I would definitely suggest referring to Practical Python and OpenCV which covers them in detail. module ‘imutils’ has no attribute ‘grabcontours’. Hi! I have learnt a lot from this tutorial! I was wondering how I could count objects for images with slightly shaded backgrounds with shadows and without knowing the highest shadow value to threshold from. Please can you help me with this? Take a look into “adaptive thresholding” methods. I cover them inside Practical Python and OpenCV. Hi…thanks for building up this wonderful course. I am bit curious about the function rotate_bounded() and rotate(). Why there is non uniformity between the function when passing the angle of rotation? rotate() consider negative angles as clockwise but rotate_bounded() consider positive angles as clockwise. It was simply how I implemented the “rotate_bounded” function, that’s all. That’s definitely very strange. How did you install OpenCV on your machine? Did you follow one of my tutorials? What is the math behind converting a grayscale image to color image? Hey Ramisha — I noticed you posted a few comments across various posts on the PyImageSearch blog. 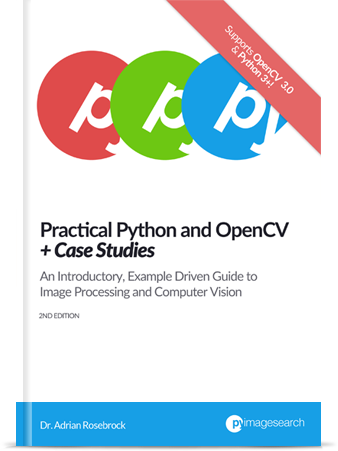 It’s great that you’re enjoying the tutorials but I would recommend you read through Practical Python and OpenCV — that book will teach you the basics.